Temperatures are warming up a bit but water temperature in lake Powell is holding at 45 F along with Lake Elevation at 3576. The lake continues to decline and the weather is still cold for Lake Powell standards. Lake surface temperature is now 45F, which is near record lows for this time of year. Despite all the reasons to stay home, we bundled up and headed uplake to check out striper school behavior in the uplake canyons. It was a cold ride up and back but the fish did not disappoint. The secret to finding striper schools in the major canyons in the southern lake is to go to the backs of the canyons. When you are near the end of the canyon, watch the graph closely. Once the depth is consistently shallower than 50 feet, stop the boat, turn around and head back out looking for drop offs. The best success we found was at 85 feet in the middle of the channel where the depth quickly dropped from 65 to 85 feet. Then look for schooling stripers on the bottom. I was fortunate to be riding with my friend who had a boat with a spot-lock trolling motor which automatically holds the boat right over the school. Shortly, after 9 AM on a cloudy, overcast day, we spotted few fish traces on the bottom at 85 feet. The spot–lock was engaged and spoons were deployed. After a few minutes of jigging along the bottom, the first striper hit the spoon and the school was energized. The graph lit up with many more curious fish, which sensed the energy of the first hooked fish, and came quickly to see the fish swimming up with a “shad” in his mouth. They were met with a few more feeding options as more spoons fluttered into the school. We stayed over the active school for an hour and experienced many double and triple hook ups. We guessed there were about 40 fish in the cooler after the first encounter. We made another circle around the same area using the same graphing techniques in 85 feet of water and found another smaller bunch of fish. We added another 15 fish to the cooler with the same spoons. Then we moved on one more time when that school lost interest. We went back to the first successful spot, saw a few more fish on the graph and caught nother 10 fish. After 3 hours of catching fish, we headed back down lake through Padre Bay, through the main channel to Antelope Marina and finally arrived at Wahweap Main ramp. At the fish cleaning station (which is partially open thanks to the NPS) we counted out 68 stripers, all in good to excellent condition. It was a great day of fishing with two hours of boating up and back. We used a variety of spoons including homemade 1.5 ounce jigging spoons, Rapala Jiggin’ Rap and SteelShad 1-ounce metal bait. Fishing will get even better as the weather warms up and water temperature rises into the 50s. 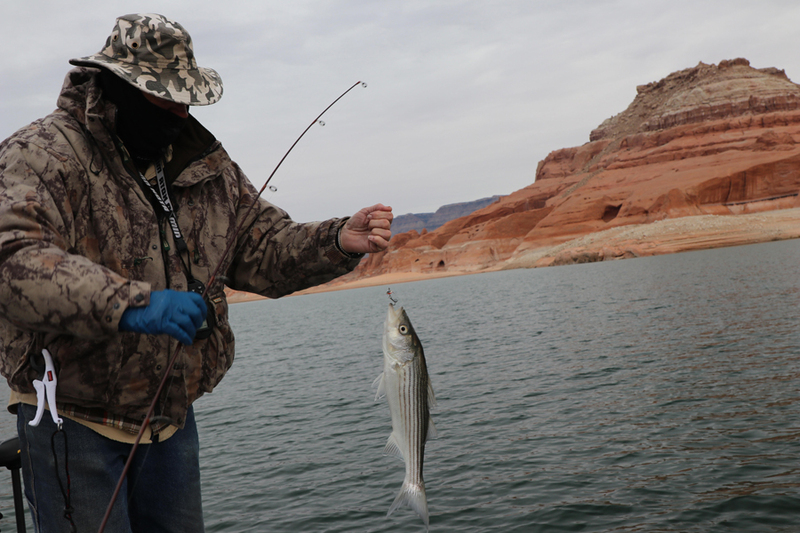 For now, fishing is still good for stripers at 85 feet in the back of the canyons with jigging spoons.